Lisa started to go to work on painting the south end of the porch this afternoon. Unfortunately, she didn't get that far. 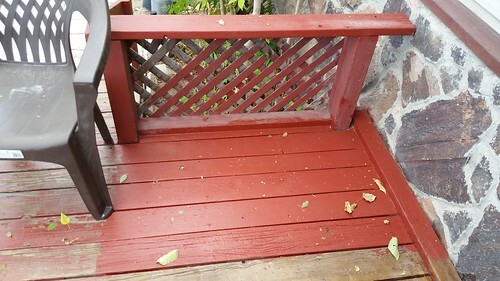 After Lisa got this portion of the porch painted, the wind came up and started blowing harder and harder. High winds and painting don't go together, so she quit. Leaves have blown in on the drying paint, but we think that we'll be able to get most of them out tomorrow. The section that Lisa painted first was where the wood box will go, so once it dries we can put the new box in place. Further painting may be delayed until next week for reasons I'll explain later this week.